Includes No Cover Charge at all participating locations, Entertainment, Sombreros, Great Drink Specials until Midnight, Fold-Out Crawl Map, and Guaranteed Good Time at 40+ locations! Must be checked in by 8:00 PM. Includes everything with regular Advance tickets, just at a great group discount when you buy 8 or more tickets together! With your upgraded ticket, you'll get FIVE amazing bonuses PLUS all the benefits of your general admission ticket that includes waived cover at all locations. Must be checked in by 8:00 PM. With your upgraded ticket, you'll get amazing bonuses PLUS all the benefits of your general admission ticket that includes waived cover at all locations and a bonus event booklet with over $100 in offers and specials. Must be checked in by 10:00 PM. 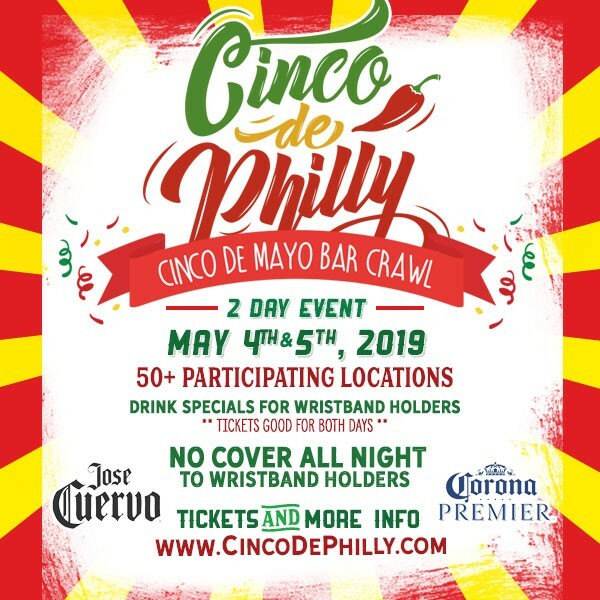 Join us for Philadelphia Cinco de Mayo Bar Crawl happening Saturday, May 4th and 5th, 2019 from 3:00 pm - 2:00 am (Saturday) and 12:00 pm-3:00 pm (Sunday) and celebrate with 50+ of Philadelphia's top locations throughout Center City, South Street, Old City, and Manayunk. This is the go-to event this Cinco de Mayo! Cinco de Philly will give you access into 50+ locations, No Cover Charge all day at all locations plus great drink specials (3pm - Midnight) with your wristband. Stay and party all day and well into the night! If that wasn't enough, grab your Cinco party swag while supplies last at check-in along with a coupon book offering some amazing deals. You get a party atmosphere at all locations. We have something for everyone. Just look at all the participating bars and restaurants - they are THE places to be in the city! Ticket Prices may increase closer to the event. Absolutely, positively the BEST places to be in the city of Philadelphia on Cinco de Mayo! VIP Experience: Grab up to 5 Free Drinks or Food Items at Participating locations! Beers, Drinks, Shots, Food! No Cover and Great Drink, Beer, & Shot Specials until midnight at 40+ Locations for Ticket Holders. That's right, grab your ticket to fun and we have you hooked up - BIG TIME! Bar Crawl Map of all locations INCLUDING a coupon book with special discounts and offers! Free Sombrero, glasses, hats, and other Cinco de Mayo swag to make your crawl complete! While Supplies Last! Gather your friends & co-workers. Join us for the single greatest Cinco de Mayo crawl in the history of Philadelphia! Corona and Upcoming Events remind you to please enjoy yourself responsibly. If at any time you feel like you need a safe ride home, please speak to a bartender or staff member for assistance. No Refunds.